I hope everyone is keeping warm! We are doing some rearranging in the store again. So, pardon our mess! Meanwhile, life goes on. Peggy Packer will demo decorative punches Tuesday night at 6:30. Peggy always shows us something new! Marla Nejvara will teach her Masculine card class on Thursday the 31st at 6:30pm. If you are interested in taking this class, you need to register by Tuesday! The fee is $15. Thursday we will have our Make & Take from 1-6pm and repeat it on Saturday from 1-3pm. $1 per card, limit 3 of each card. It is always a good time. Join us if you can! Too Cool! Sandy will demo these on Tuesday! We are off to a great start! Karen’s Demo was so much fun! 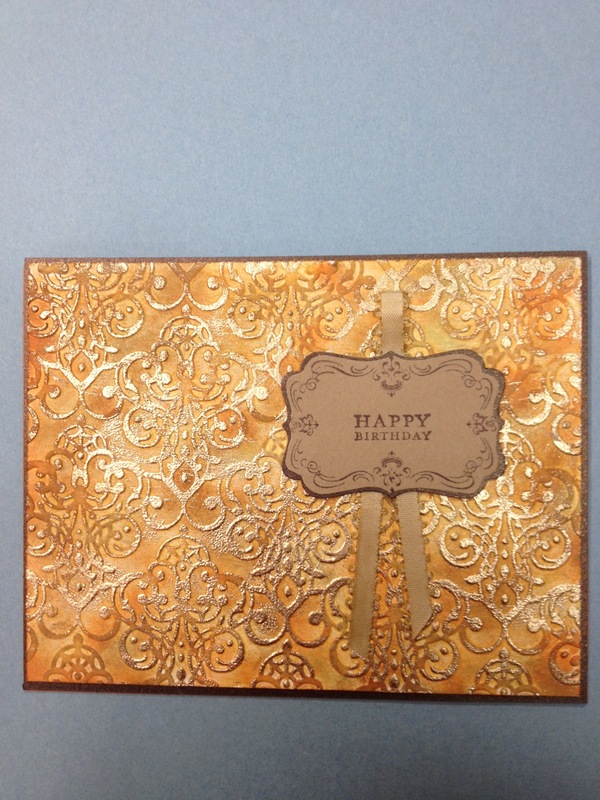 I have a sample of her Card gift box and the instructions for those who missed it. 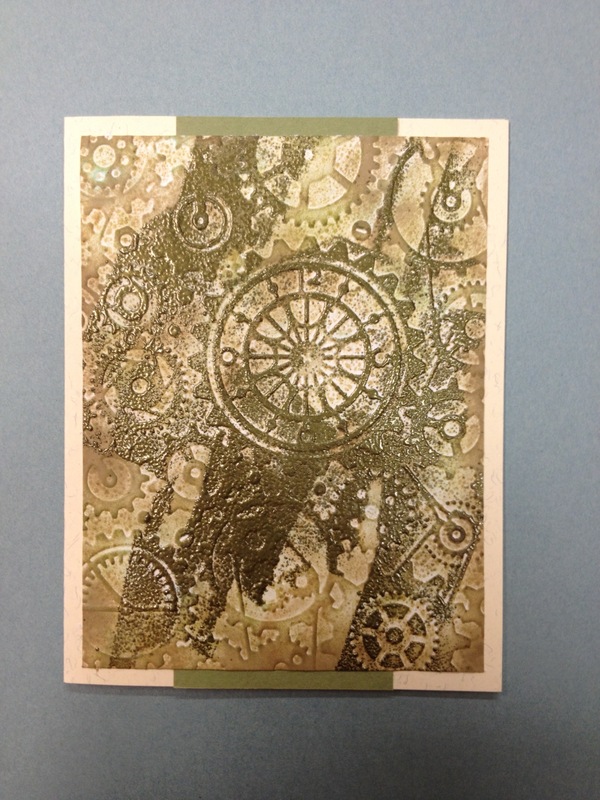 This Tuesday Sandy Booth will demonstrate a Faux Patina background technique. That should be interesting! Be there by 6:30pm to get a good seat! Just a reminder, This Week Is Coupon Week! Bring your Michaels, JoAnn’s or Hobby Lobby coupons in and redeem them for up to 40% off any item not already discounted. One coupon per customer per week please. Also, If you haven’t picked up your stamp of the month card, ask for one when you check out. Use your card once a month to get 40% off the stamp of your choice. (not good on already discounted stamps or on sets that contain dies and/or embossing folders) . 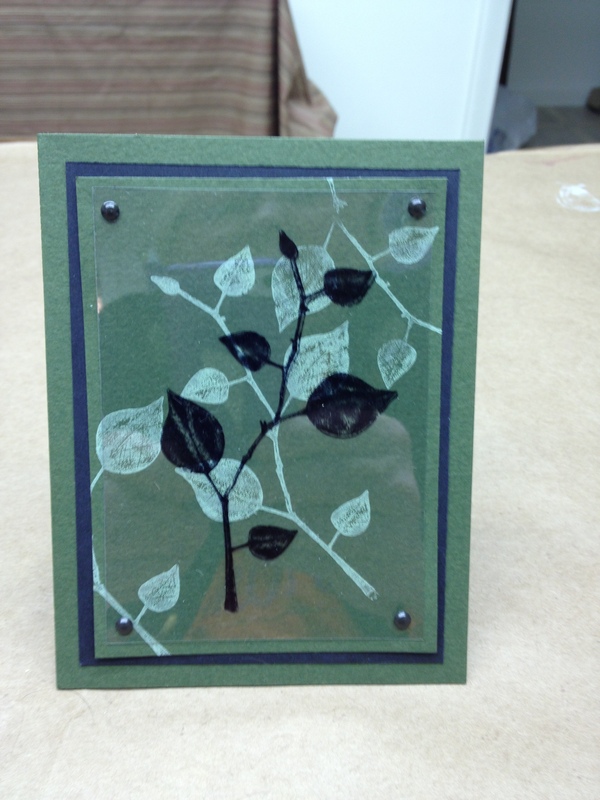 This Saturday, January 19th, is Sue Freeman’s Stamping on Acetate class. Preregistration is required and payment is appreciated at the time of registration. The class starts at 12noon and the fee is $15. 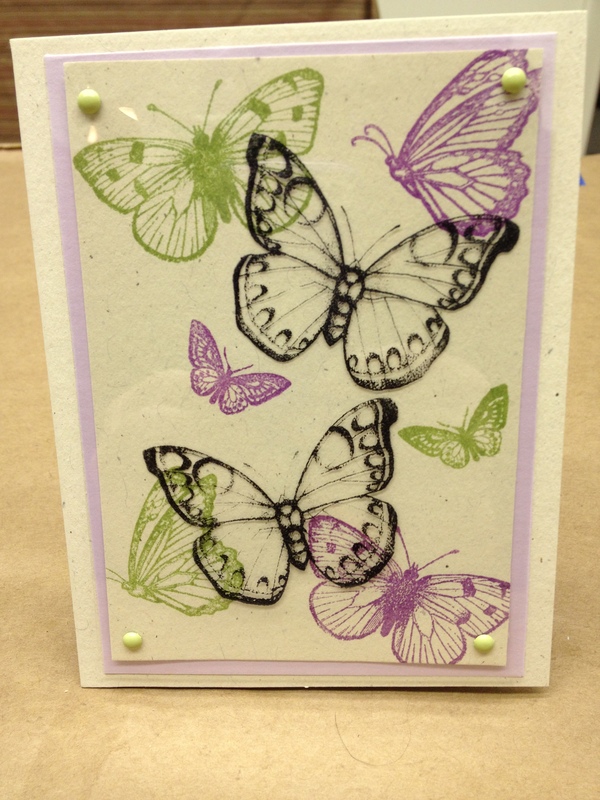 Don’t miss your chance to experience stamping on acetate! Photos of the cards can be seen on our website. 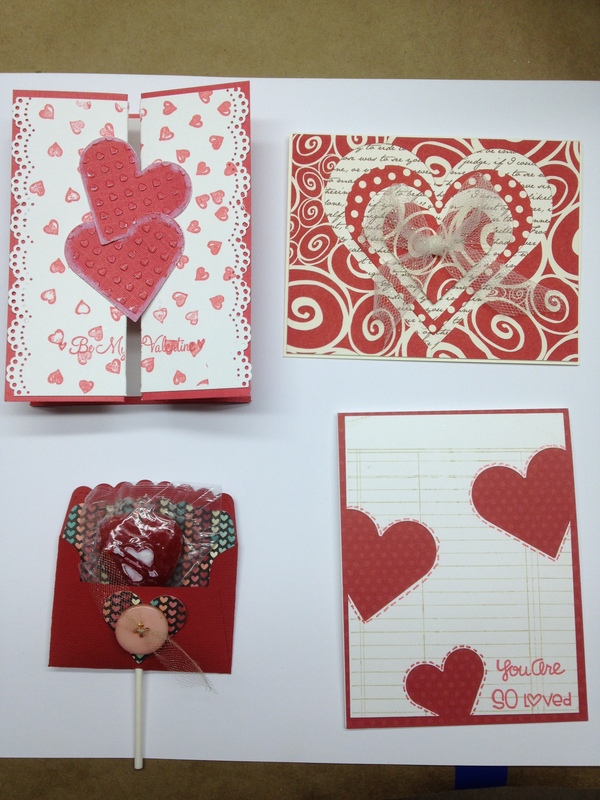 Saturday, January 26th, at noon is Karen Schwochow’s Valentine Card Class. The fee is $15. Preregistration is required. Pictures can be viewed on our website. For those of you interested in Zentangle, I got in 3 different Zentangle books recently. They are on the check out counter. We are going to try something new on Wednesdays. I have been thinking about starting a “workshop Wednesday” program. I will choose a technique or product to help people with. Participants will bring or buy whatever they need to complete a project of their choice using the technique. There will be no charge for the workshop. It is not necessary to register, just stop in between 2 & 6pm. The first workshop Wednesday will be this Wednesday. It will start at 2pm and end at 6pm. I will be teaching the sticker and glitter technique that so many of you have asked for. If you wish to participate, please bring: outline stickers, Clear (warm highlight) ultrafine Glitteritz, doublesided adhesive sheets, Copic markers, (if you only have non alcohol markers bring those) white cardstock in the size you want to use for your project, scissors, tweezers and scrap paper. If you don’t have all of these items, not to worry!!!! I happen to sell all of these items! Thanks to those of you who took the time to make some cards for Operation Write Home on Saturday. Hopefully more of you will be able to join in as the we continue to meet the second Saturday of the month. I’m looking forward to seeing you this week, now that the Holidays are over! It has been rather quite around the store! If Saturday’s Make & Take is any indication, everybody is itching to get back at it! I have to say, Saturday has been a good time to do the make & takes. Thanks to all who came out this week. 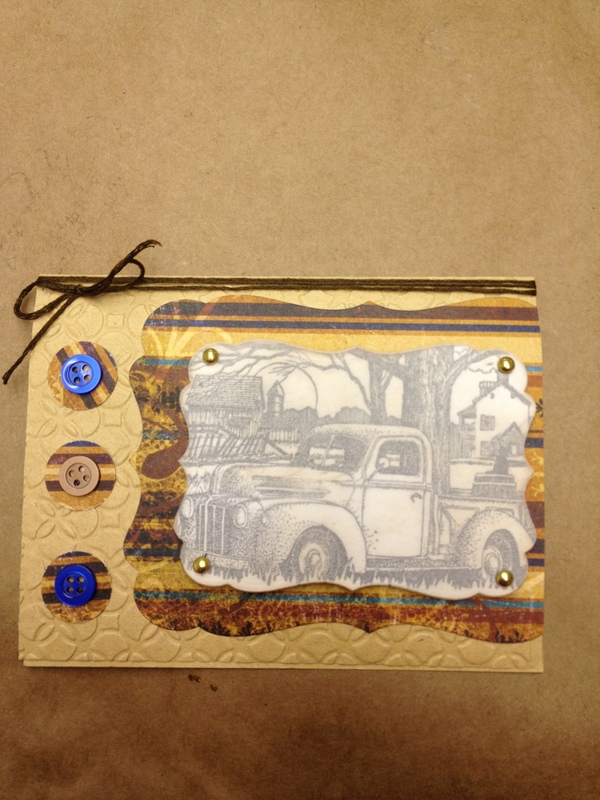 This Tuesday, Jan. 8th, Karen Schwochow will demo a cute little card gift box. I have attached pictures! You won’t want to miss it! As usual, it is free and starts at 6:30pm. 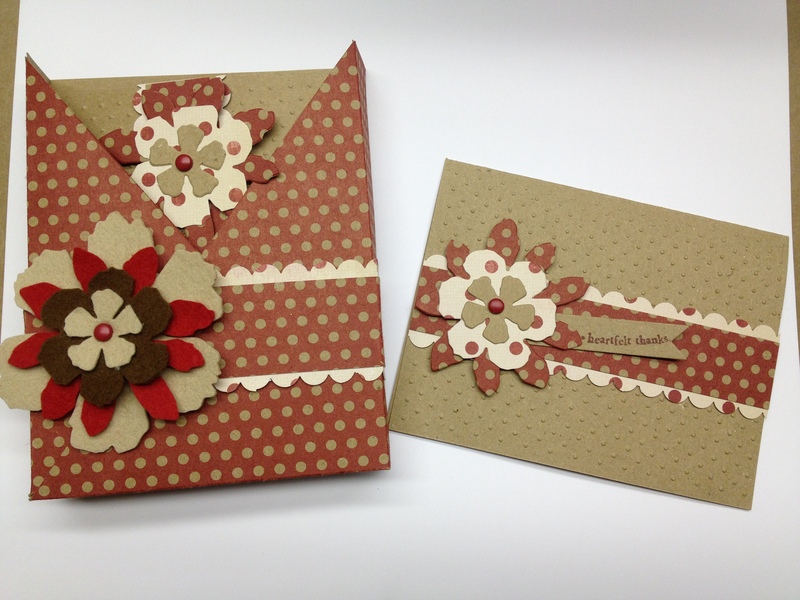 1) Cards should be A2 sized, and must include an envelope. 2) The back of the card must be stamped with the OWH logo (a free stamp is available, details at www.operationwritehome.org/free scroll past the stamps available for purchase). If you don’t have the stamp, put a note on the cards and we’ll add it before shipping. 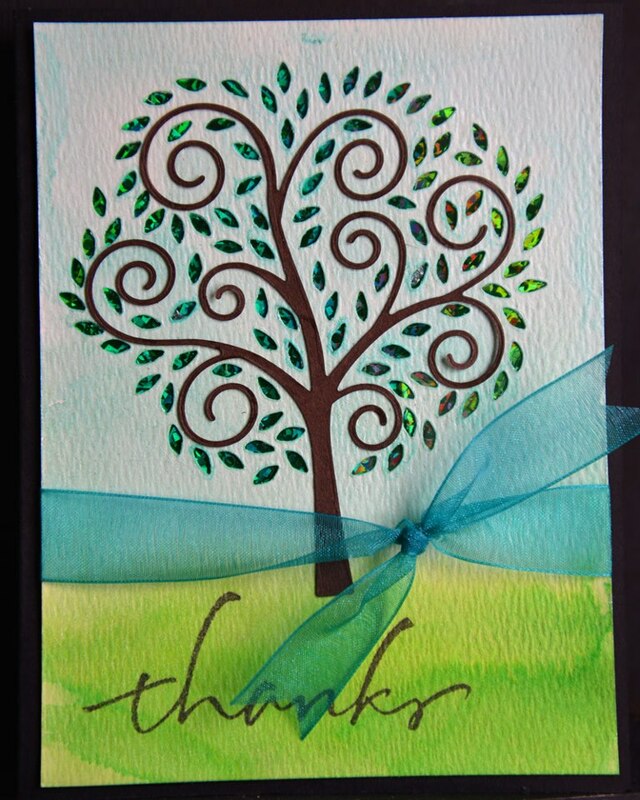 3) Cards should be on white or light cardstock. 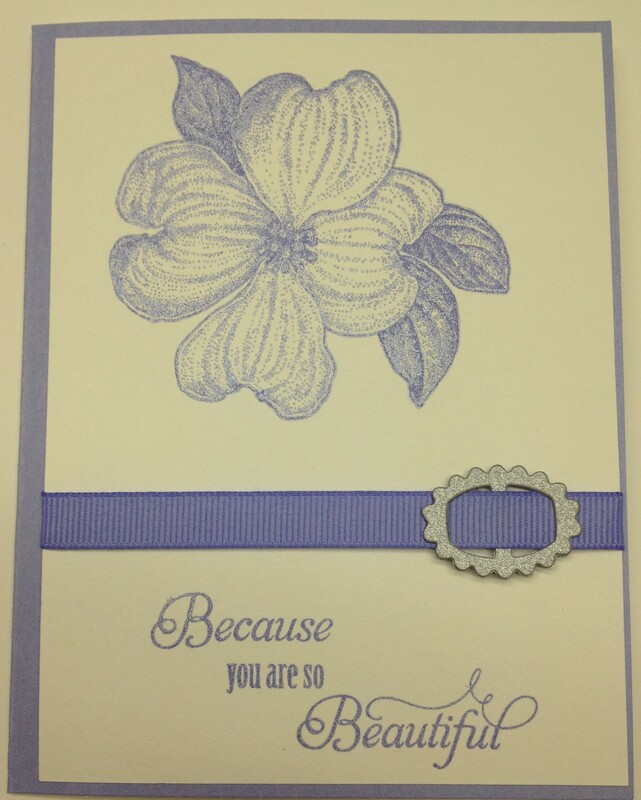 If dark card stock is used, they must be lined – line the entire inside to give ample room to write a letter. 4) NO GLITTER or other materials that might flake off. If you must use glitter, etc. cover it completely with Glossy Accents. 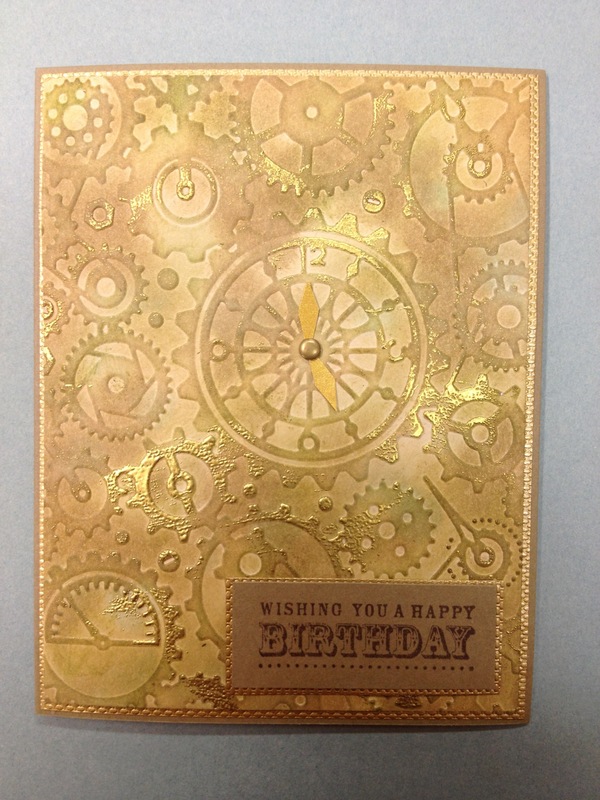 5) Stick with “appropriate” themes, and make sure your cards are timely. See the website for deadlines and appropriate themes www.operationwritehome.org/deadlines. 6) Quality is essential; quantity is not. The soldiers have requested high-quality cards to send to their loved ones since this may be their last written communication. Take the time to let your “love” show through your work – the soldiers do notice this. Note that there is a limit of no more than 20 cards of 1 design. 7) Use good, strong adhesives. 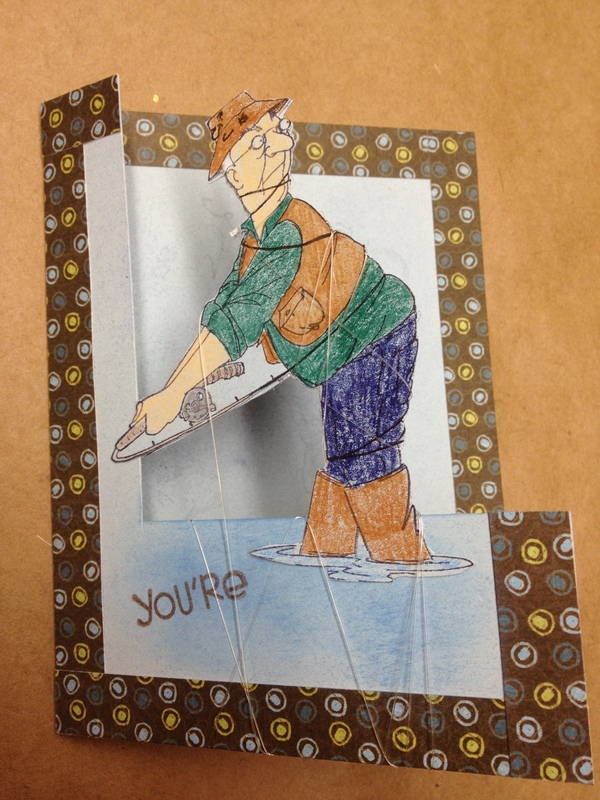 No glue sticks or overall glued cards (a little glue is fine with embellishments, etc.). Service to OWH provides you with a number of benefits in addition to the “warm fuzzies” of service to others (check out the OWH blog for feedback from soldiers and families): 1) access to tutorials, weekly “TV” webcasts, a lot of card sketches, featured designers, and some challenges; 2) a potential tax deduction for cards donated (be sure to complete a packing slip to receive acknowledgement from OWH –www.operationwritehome.org/files/OWHPackingSlip.pdf); and 3) you’ll be thinking ahead on your seasonal/holiday greeting cards (OWH deadlines are generally 6-weeks to 2 months prior to the holiday, etc.). So . . . 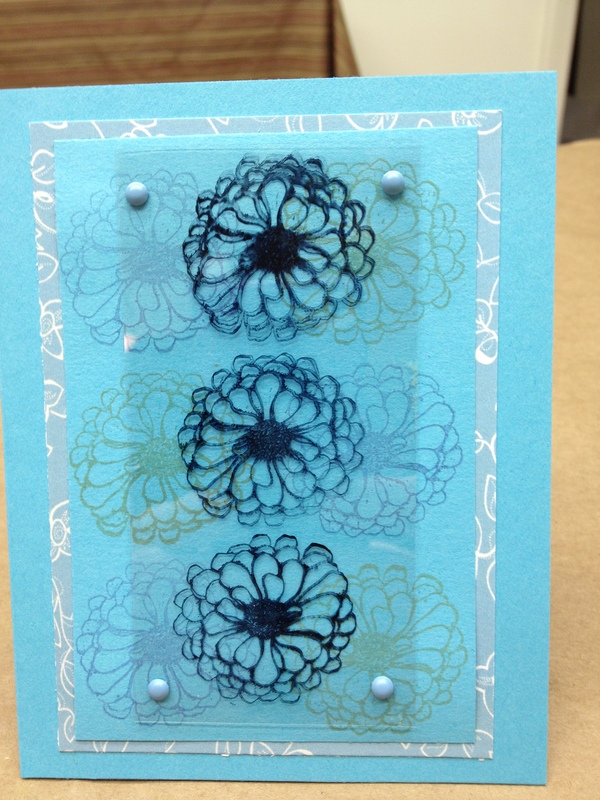 I hope you can join us on Saturday, January 12 for our first card-making session. We’ll be in the workshop between 12:30 and 3:30 — come when you can, you don’t need to be there the entire time. There won’t be a formal structure. 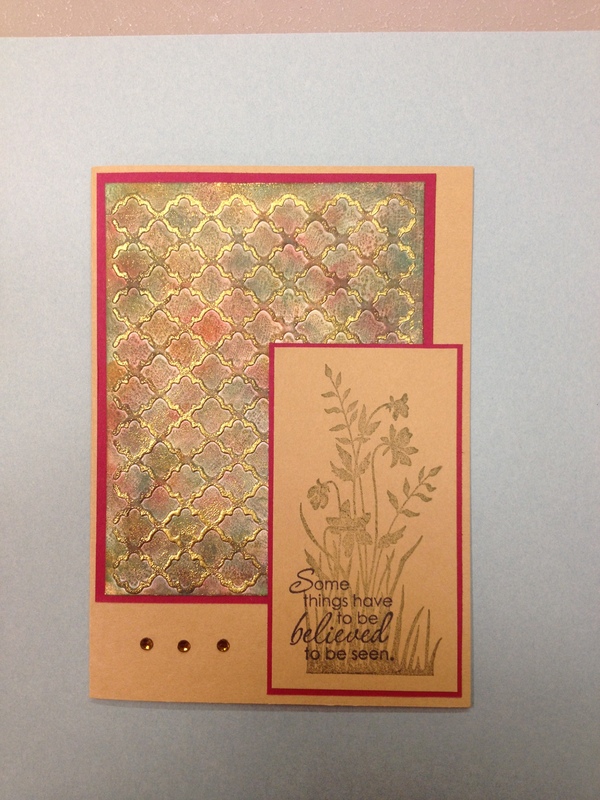 Be sure to bring the things that you’ll need to make cards for donation to OWH – i.e. 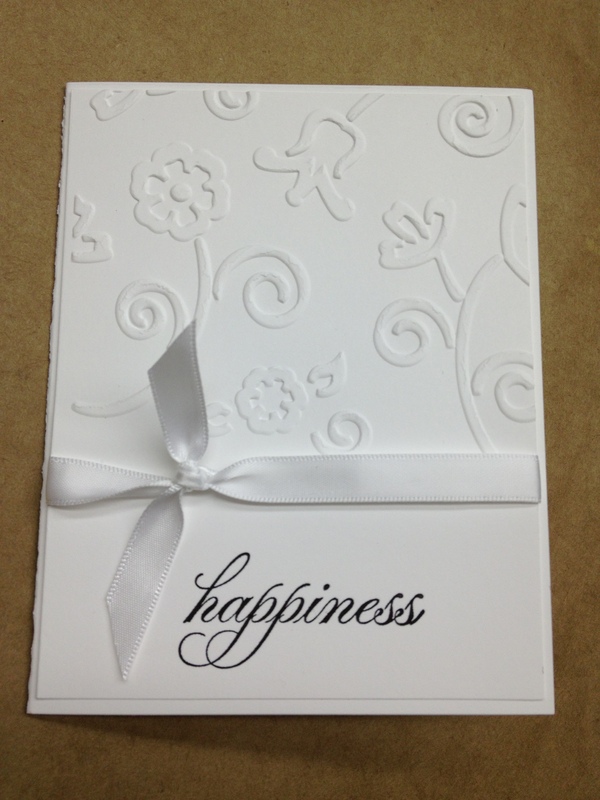 card-making supplies (paper, stamps, embellishments, die cuts, etc.) 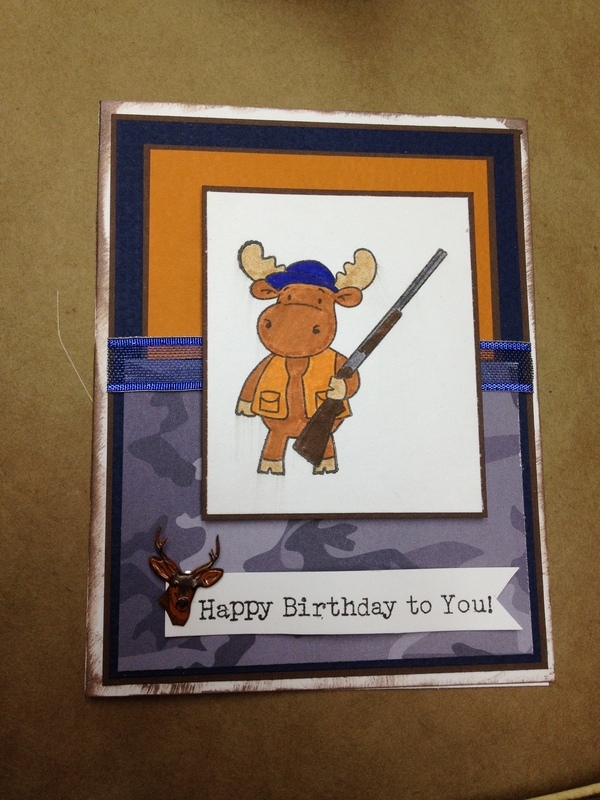 along with a basic card-making kit (scissors, adhesives, etc.). Our “theme” for Saturday is Easter cards. If you can’t join us on Saturday, you can also drop off cards at the shop. Keep in mind that OWH is done with winter-theme cards and Valentines. Focus on Easter, St. Patrick’s Day and general spring-themed cards. Birthday cards, love you, miss you and thank you cards are always needed. Note that if your Easter or St. Patrick’s Day cards aren’t at the shop before January 18th, you’ll have to send them on your own to meet the applicable deadlines. 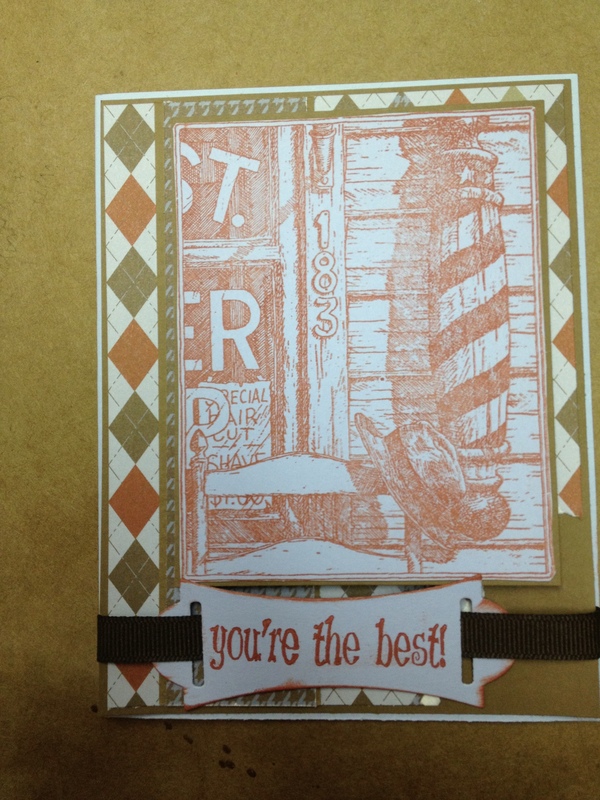 Sue Freeman’s class “Stamping on Acetate” January 12th (Saturday) at noon Fee $15 Please register as soon as possible to give Sue time to prepare the kits. I believe there is one more card, I don’t have a picture yet. Karen says there will be additional “Bling” added to these cards before the class. 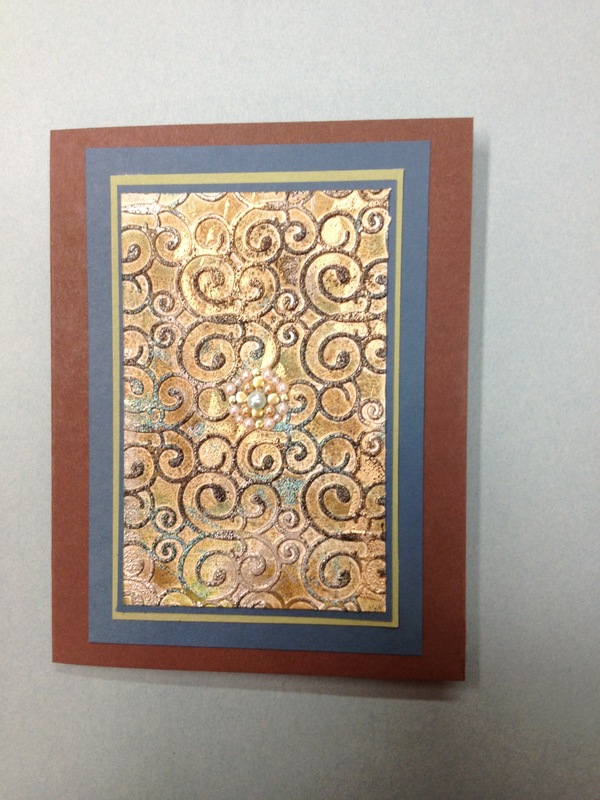 And finally, Marla Nejvara will teach a Masculine Cards Class on Thursday January 31st at 6:30pm. Pictures not available at this time. When you are in the shop next, be sure to ask for your new “stamp of the month” card. This year they are neon orange just to make them easy to keep track of!